Naval Air Station Jacksonville (NAS Jax) is located in Jacksonville, Florida, just south of the city's central business district. 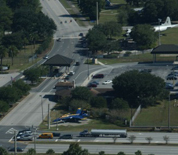 Approximately 23,000 personnel work on base, making NAS Jacksonville large enough in size and abundant enough in amenities that it can be considered a city in itself. The base serves as a major hub for naval activity and aviation training. There are over 110 tenant commands at NAS Jacksonville, including Patrol Squadron Thirty (VP-30) the largest aviation squadron in the Navy. The squadrons on base fly the P-8A Poseidon, the C-130 Hercules, the C-40 Clipper and the MH-60 Romeo helicopter. NAS Jax also has a Aircraft Static Display area called Heritage Park which is open for visitors to view historical aircraft. The city of Jacksonville offers many diverse restaurants and shopping locations for those who are stationed in the area. Additionally, the nearby beaches along Florida's Atlantic Coast are some of the best in the state. This NAS Jacksonville directory features the critical info you’ll need to navigate through the many facilities and recreational opportunities available on base.